It seems like we've been talking about the Gear 360, Samsung's branded 360-degree "action cam," for a long time without getting to see it on store shelves. For the record it was officially announced way back in February, though there were a few leaks before that. We expected it to land around the same time as the Galaxy S7 and its Edgy brother, but as it turns out the camera will launch along with the Galaxy Note 7 later this month. It's scheduled to go on sale starting on August 19th in the United States. That's according to the lengthy press release Samsung posted with the Note 7. As usual the PR doesn't mention a price, though it does specify that it will be available "online." Luckily, we've been given pricing information from an unlikely source: Verizon. The carrier everyone loves to hate issued its own press release after the event, where it mentioned that it will sell the Gear 360 in at least some Verizon Destination stores for $349.99. Carrier stores don't tend to wiggle on accessory prices without some major sale, so we're assuming that's the manufacturer suggested retail price for the US. International versions of the gadget have been available for a while, but without any official US retailers the import price has been inconsistent and warranties are unreliable. 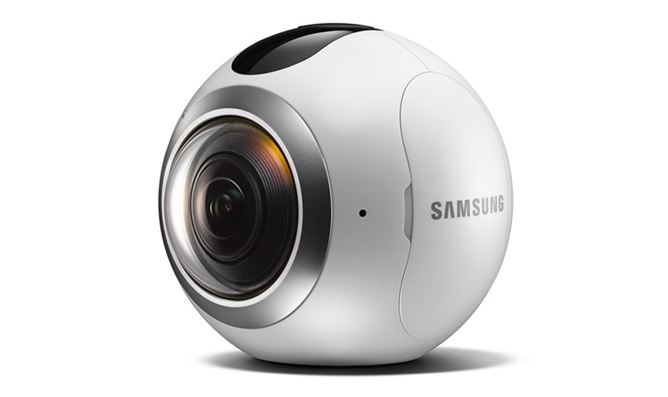 The price isn't cheap, but it's comparable with similar gadgets like the GoPro (specifically the Hero 4 model), with the added benefit of Samsung's swanky design and dual fisheye cameras that shoot 360-degree video, perfect for exporting to "VR" applications. The Gear 360 records and stitches at 3840x1920, and its F/2.0 lenses should be at least decent in low light. The gadget is dust- and water-resistant, just like Samsung's high-end phones, and Bluetooth or Wi-Fi connections can offload images and videos to phones or local networks. If that's too much hassle, it can record directly to a MicroSD card. The Gear 360 will work well enough on its own, but only recent Samsung phones get access to the official manager app. Because whenever a technology executive says "synergy," his eyeballs turn into dollar signs like Scrooge McDuck.